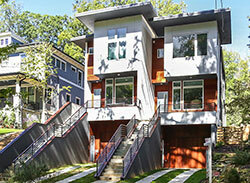 Environs Residential is an environmentally conscious Design/Build firm. We improve and construct new homes with thoughtful design, quality construction & finishes that suit our client's taste and budget. Environs Residential Design & Construction is a turn-key home improvement company, specializing in environmentally responsible and ecomonically prudent renovations for early and mid-century Atlanta homes. Dawn and Terry formed Environs Residential in 2001 as an environmentally conscious home building company. We offer custom home renovations, kitchen remodels, bathroom renovations, and a variety of other home improvement services. 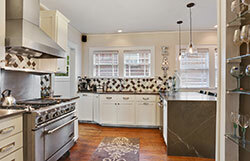 "Slick Modern Townhome in Midtown Hits Market at $879k - Not your average duplex"
...the kitchen is probably the most strikingly modern facet here, providing a little variety from recent contemporary interiors around Atlanta. Another unique component: the borderline brutalist staircases that unfurl down to 7th Street. ©2018 All Rights Reserved. Environs Residential.